Nicola Brandon started horseback riding about two years ago, and since then has been in many competitions. 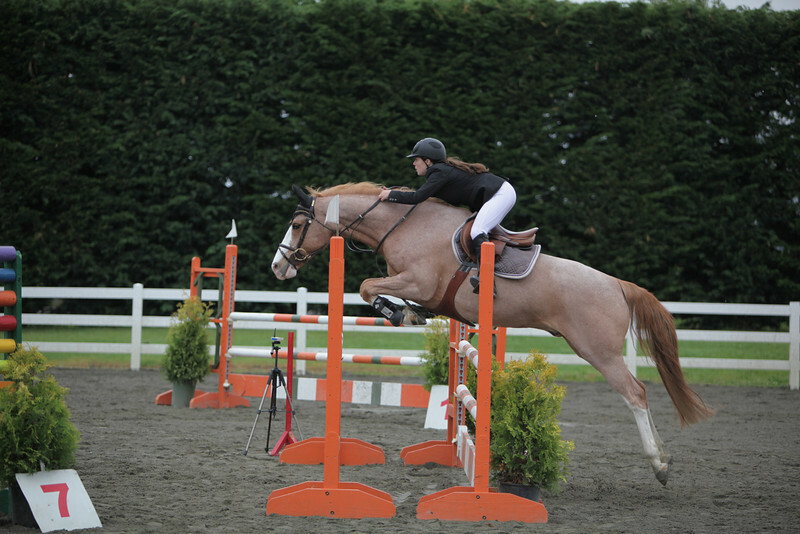 Nicola says, “We will normally do two competitions a month and its all year round.” The events that she and her horses compete in are called show jumping competitions. In jumping, the horse and rider are required to negotiate an obstacle course while the horse has to leap over different obstructions in its path. If the horse is not able to clear a jump, points are taken off. The time it takes to complete the course is also important to the score. However, Nicola has not been competing for several months. There was an unfortunate setback involving her old horse, Outlander. “I competed at the Spruce Meadows in June, and then Outlander hurt his two back legs.” The show jumping event in Monroe next month will be the first one Nicola has been in since June. She will be competing with her new horse, Zi Zodine, or Zoe for short. There are several reasons that Nicola loves horseback riding so much. She says, “No matter what you have on your mind and what’s going on, when you ride, you don’t think about anything because you’re so focused.” This allows Nicola to not be nervous while competing, as she does not have to focus on the spectators. Nicola will be competing in April, and I think that all of us at SAAS wish Zoe and Nicola good luck.